“Seriously, you better have something baked for me by the time I arrive to SLU…” my best friend, Katie Prue says to me over the phone in anticipation of her visit to her alma mater for Labor Day weekend. “Of course, Honey Bunches,” I reply as I immediately start brainstorming ideas. Bex gets pretty pumped when she has a good friend to bake for. I only saw it fitting to grab hold of some Ben & Jerry’s “Americone Dream” (vanilla ice cream with fudge covered waffle cone pieces and a caramel swirl) in honor of Labor Day weekend. In a medium bowl, cut up two ripe bananas and then mash with a fork until smooth. Mix in oats, sliced almonds, coconutter, vanilla extract and baking powder until combined. Separate the dough into four equal balls. Then shape and flatten dough into four large cookies and place on a cookie sheet. Bake for 10 minutes. Let cookies cool completely before adding the ice cream in the middle. To add the ice cream, simply cut through the pint of ice cream container to get a good, thick chunk for your two cookies (if you don’t know what I mean, watch this video). Then sandwich the ice cream between the two cookies and remove the wrapping. BOOM. 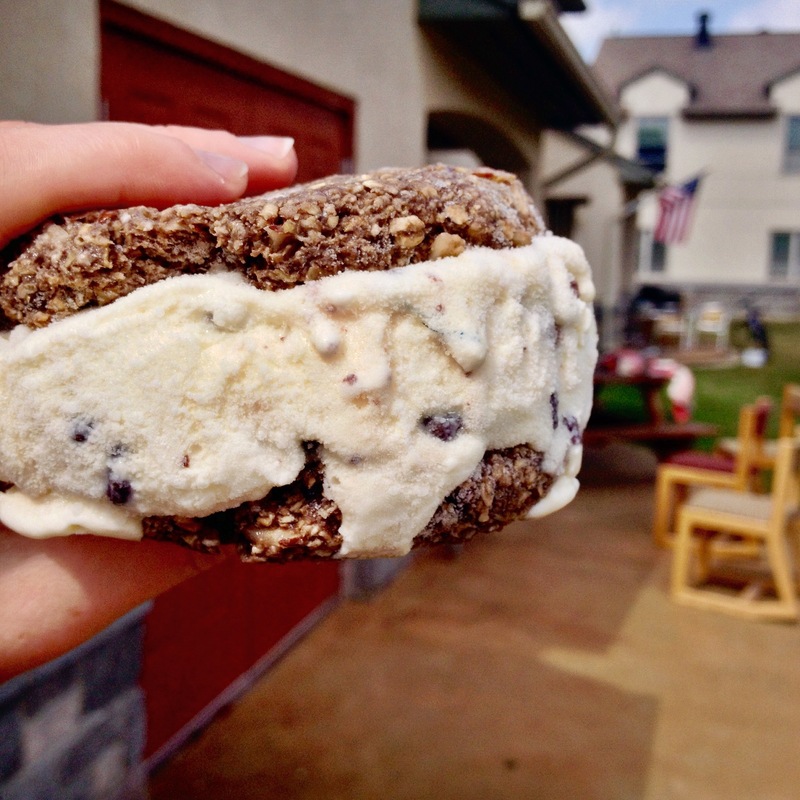 You have one mean ice cream sandwich. Do the same with the other two cookies and then place both in ziploc bags to pop in the freezer and eat whenever your heart desires! Bon appétit! It has always been my belief that good writing like this takes researching and talent. It’s quite apparent you have carried out your homework. Hi Korey! Thank you so much! That means a lot to me. I try my best to engage my followers and allow my writing to truly reflect my personality and journalistic style. Happy Thanksgiving!